December 20, 2012. A book of sailing short stories that needs to be in every sailor's library. Chris Caswell is a columnist for Sailing Magazine and edited this book. For thousands of years, man has sailed into battle, sailed for rumoured wealth, and sailed for pure adventure. And for nearly as long, stories about the sea have entertained, intrigued, and inspired readers. 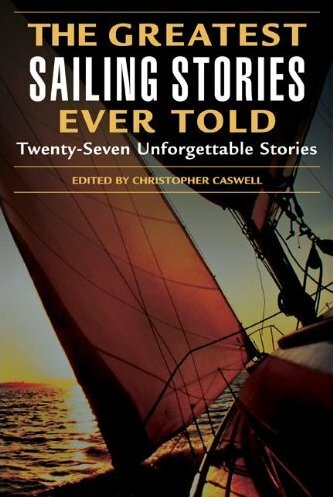 The Greatest Sailing Stories Ever Told brings together some of the most compelling writing of the millennium. Here is Peter Goss's wrenching narrative of incredible courage in the world's most desolate ocean; Ernest Shackleton's understated and awesome account of one of the most daring small-boat journeys ever taken, where failure meant certain death for his long-suffering crew. But sailing is much more than headlong dashes into roaring seas. You'll also find William F. Buckley Jr. on idyllic cruising; James Thurber on the arcane and often impenetrable language of sailors; the legendary Joshua Slocum on sailing alone around the world. The Greatest Sailing Stories Ever Told is a treasure trove: tears, adrenaline, laughter, and adventure abound. With contributions from: James Thurber, William F. Buckley Jr., Ann Davison, Sterling Hayden, Ernest Shackleton, Tristan Jones, Samuel Eliot Morrison, Joshua Slocum, E. B. White, C. S. Forester, Cleveland Amory, Weston Martyr, Peter Goss and David Kasanof. Some of the most compelling writing in the history of man and the sea is embraced in this one volume. It will keep you aloft on the yard till dawn. This book is awash with entertaining narratives. "100 Tons of Bronze, Son"